Description: this is a strange hollardops, comming from pragian of Ofaten, it's a very rare species, with a little snoot in the preglabellar area. 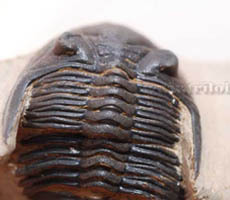 The genal spines are long and sharp, pygidial spines are long more than normal. 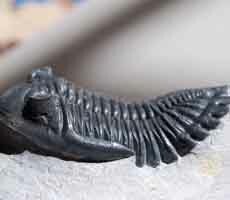 We think that this species was never been described. 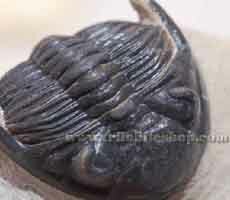 Description: The best quality of Hollardops, with a smooth dark black skin, the lenses in the eyes are preserved carefuly. 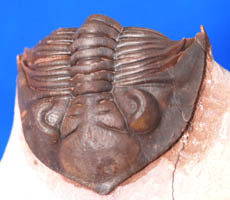 Description: this is a new trilobite, it's hollardops mesocristata, tubercles are on its cephalon and thorax segments, the genal spines are pointed. Description: a beautifull hollardops, the color of it's skin is black, the lenses of eyes are amazing.